Out of all the e-cigarette companies I looked at in 2014, VaporFi was probably the one that impressed me the most. With their careful product selection, they have managed to find e-cigarettes and vaporizers that should appeal to every possible customer from the complete beginner to the experienced expert. All of these vaporizers are offered at reasonable prices and are well differentiated from those offered by the competition. Occupying the upper end of the product range is the VaporFi Rebel II, a variable-voltage and variable-wattage e-cigarette with a top power of six volts or 15 watts. UPDATE: VaporFi discontinued the Rebel II in 2016, but I’ve got good news! The VaporFi VOX Mini is smaller, has power power and costs less! View the Rebel II at the VaporFi website. Clicking my link will grant you an automatic 12 percent discount on all VaporFi purchases; you’ll see the confirmation upon clicking the link. The VaporFi Rebel II is priced at $129.99, or $114.39 when my coupon code is applied. This puts it in the same price range as the original ProVari, with one very important difference; buying the ProVari at this price only gets you the device, while the VaporFi Rebel II is a full kit. The second key difference between the ProVari and the Rebel II is the over-current limit of the two devices; the ProVari supports a maximum current of 3.5 amps, while the Rebel II maxes out at 4 amps. This means that you can drive low-resistance attachments harder with the Rebel II without encountering over-current protection. Included with the Rebel II kit, you’ll find a small battery and a large battery rated at 600 and 2200 mAh respectively. The bottom half of the vaporizer has telescoping threading, allowing it to support both sizes. You’ll also find a battery charger and the VaporFi Rebel tank, an attachment that costs $49.99 on its own. The Rebel II edges the ProVari out here as well; the ProVari kit includes a plastic tank with a retail value of about $15, while the Rebel tank is glass. 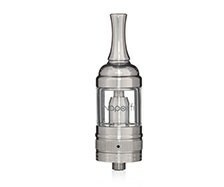 For me, no review of the VaporFi Rebel II would be complete without an in-depth discussion of the included tank. Although many of the world’s e-smokers have migrated from cartomizers to tank systems over the past year or two, I’ve been a holdout and have continued to use dual-coil cartomizers to this day. For me, tank systems have always failed in one of two areas. Either they’re made of plastic and change the flavor of the e-liquid you’re using, or they fail to feed the e-liquid reliably and randomly produce harsh, dry puffs. The Rebel tank is the first tank that’s actually changed my mind. Most importantly, at least to some of you: the VaporFi Rebel tank is a fog machine. I’m not one for rebuildable atomizers myself, nor have I ever tried using one. From my point of view, though, the Rebel tank produces some of the most voluminous vapor clouds I’ve ever seen. I actually began to feel dizzy after an extended vaping session with the VaporFi Rebel II, which is extremely rare for me. I’m sure that many people buy advanced personal vaporizers with the intention of using them with the tanks or cartomizers they already have. The VaporFi Rebel II is the first APV I’ve ever owned that made me want to use it with the included attachment and nothing else — the Rebel tank is that good. If you’re considering upgrading from your first e-cigarette to the Rebel II, try the included tank before purchasing any third-party accessories; I think you’ll find that you already have the perfect tank system. E-cigarette technology made an enormous leap in 2014. For several years, the ProVari was the only device I’d ever used that didn’t have a noticeable decline in vapor production when the battery was mostly drained. Then came the SMOK BEC Pro, a device that boasted even performance from the beginning to the end of the battery’s life but had serious shortcomings in its Bluetooth technology. The VaporFi Rebel II is the third device I’ve used that shows no discernible drop in vapor production as the battery is drained — something that greatly impresses me. Testing the Rebel II versus the ProVari, I find that the Rebel II has a slightly shorter automatic cutoff, forcing your maximum time per puff to be a few seconds shorter. In practice, though, I found that my puffs weren’t interrupted frequently enough to matter. At a given voltage or wattage setting, my opinion is that the Rebel II and ProVari P3 produce the same vapor volume. The build quality of the Rebel II is excellent. The device has two moving parts: a telescoping middle section and a bottom cap. Both parts are well machined, have lubricated threads and spin freely without squeaking or scraping. Unlike the ProVari — which requires an adapter for eGo attachments — the Rebel II supports both 510 and eGo attachments out of the box. The controls are simple, with two side buttons for voltage and wattage adjustments and a large center fire button. Holding the side buttons simultaneously switches between the voltage and wattage adjustment modes. The fire button is lit, turning red when the battery is low on power. The VaporFi Rebel II is simply the best personal vaporizer that I know of for under $200. It offer performance equal to that of the ProVari — better if you need the extra half amp of headroom with low-resistance attachments — and comes at a far lower cost for a full kit. The included dual-coil glass tank system is the best I’ve ever used, with enormous vapor clouds at any voltage setting and pure, accurate flavor. Although I can appreciate the simple design of the ProVari’s one-button control system, I much prefer the three-button system of the Rebel II for fast adjustments. If you are interested in sub-ohm vaping and building your own atomizer coils, neither the Rebel II nor the ProVari would be the right device for you. In this situation, you should look at the VaporFi VOX 50 instead. Otherwise, the Rebel II is the ideal personal vaporizer for any experienced e-smoker. This device is going to amaze you, and it’s not going to be a major sting on your bank account. You might even consider buying the Rebel II if you are a heavy smoker and don’t own an e-cigarette yet; because it’s so easy to fill and use, the Rebel II essentially has no learning curve.